KKK costumes in N.C., 1870. Engraving by US Marshall JG Hester. NY Public Library. 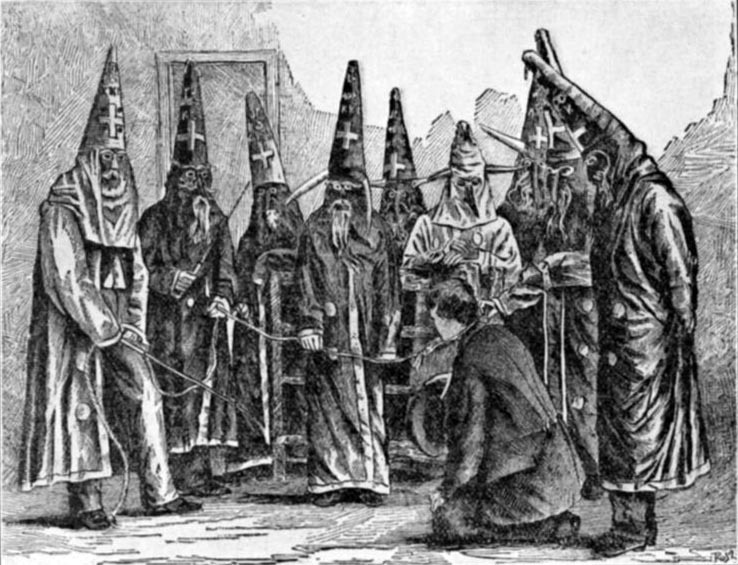 Some time ago, I posted an essay about the Ku Klux Klan’s terrorization of Orange County, North Carolina, in the years following the Civil War. Recently, I recovered from my files evidence of the Klan’s rampages through neighboring Granville County as well. The following petitions, sent in 1868 and 1869 to North Carolina’s Republican governor, William W. Holden, include the names of numerous Granville County men of color who were free from slavery long before the Civil War. Silas L. Curtis, Terral Curtis, Cuffee Mayo, William Tyler, and A. B. Kerzy lived in the Tally Ho township of Granville County. Having grown up before the war, they were forbidden by law to learn to read or write; thus, most of the men were semi-literate or illiterate. Silas Curtis, who wrote both the petitions, was an exception. The 1868 petitioners belonged to a local branch of the Republican Union Leagues (also called Loyal Leagues) which were under assault by the Ku Klux Klan. The Klan, determined to turn back Reconstruction, drive Republicans from power, and reassert dominance over African Americans, functioned as a terrorist arm of the pro-Confederate southern wing of the Democratic Party. The petition is blunt in describing the violence wreaked upon the community, and includes details of the sexual humiliation of a woman of color and the attempted murder of another. The petitioners are adamant in declaring their rights and their need for state assistance. In signing or allowing their names to be placed on such a petition, they risked great personal danger. A note at the bottom asks its deliverer to hand the petition directly to Governor Holden to prevent the “Rebels” from destroying it. I recognize many of the men’s names from the extensive research I conducted in county records while writing my first book, Unruly Women. In that book, I discussed A. B. Kerzy (Archibald Kearsey), at some length for his participation in underground trading during the war; others are mentioned as well. Although I also briefly mentioned the petitions, they are published below in their entirety. I take the privilige of writing to you on this occasion for this reason, not because we are scared out, but in the first place, you are our State Executive. And when we are having outrages comitted among us, you are our only refuge to which we have to flee for advice and protection. Therefor I take the privilige to inform you of some outrages comitted amoung us. And it is not only now and then—it is geting to be a genrel thing. On Saturday night last, the Ku Klux were raging in Oxford and Tally Ho. They first formed themselves in line in front of the Colored School Room, thinking the Leagues men were at lodge in there. And failing to find them, went off to other places and don the same, tho as it happen the leagues had adjoined [adjourned] before they came out and they watched them. And they now say they intend to brake up the Leagues before the Election. Col. Aimey, in a speech on Friday last at Oxford, [said] that if we would stop the Leagues he would stop the KuKlux. And if not, he could not do nothing with them. On Thursday night last they went to a Colored man’s house and got him out and Beet him cruley, beet his wife and cut her dress open and tied her to a tree—then told them if ever they told it, or told who it was, they would kill them. They then went to another one’s house and comence to tarring the top of his house off and some of them at the door. I broke in [and] got hold of his wife—he got out of the way—and got her out and she got loose and ran and they shot her in the back and by the side of the face and she now lies in a low state of helth. And a few nights ago they went to another colored man’s house and treated him the same. I will now give you the colored mens names: Ned Mallory, Parson Jones, and Pressley Herndon. Those white men was John C. Hugen, William Stem, John Wheeler, John Day, William Boles, Hay Stem, and one by the name Bishop, Jack Boothe, Flay[?] Moor, Sam Boothe, Henry Hasken, Flucher [Fletcher?] Moor, Tom Jones, Wm. Jones, and others—that are comiting these outrages. And I have not told near all they have and are doing. We appeal to you—for some protection in some way. Such men oght to be stoped in their outrages. *Ulysses S. Grant, Republican, and Horatio Seymour, Democrat, were the 1868 candidates for the U.S. Presidency. The second petition, 1869, protests Tally Ho’s township election, claiming that Democrats deliberately miscounted votes in order to claim victory for their own candidate. This petition, also written by Silas Curtis, contains similar but fewer names and appears to have been written in much greater haste. One of the appended names, “Lunchford Wiliford” (Lunsford Williford), caught my eye immediately. Lunsford was the son of Susan Williford, a poor white woman who appears prominently in chapter four of Unruly Women. Antebellum North Carolina laws against interracial marriage forbade Susan to marry Peter Curtis, who, like Silas L. Curtis, belonged to one of Granville County’s most prominent free families of color. Susan had several children by Peter Curtis, though it’s not clear whether Curtis also fathered Lunsford. Nevertheless, Lunsford became part of the Curtis family when he married Harriet Curtis, the daughter of Peter’s sister, Nancy Curtis. Note that this petition proclaims an alliance between “the colored race and the labering class of white people,” reflective of kinship ties that created vibrant communities of mixed-race people in North Carolina. Dear Sir, We the Republicans of Granville County most respetifully protest against the township election of Tally Ho in consequence of the way it was conducted. And do earnestly believe that it oght to be remoddled, and a fair and square election given. We most recollect that the Democrats will—and do—do all and everything they can to get in power. And they think if they can fool the Republicans, as they have already done at Tally Ho and other places, and get in power in the townships. By that means, after awhile, they can get the county offices and from that to the state’s offices and United states offices. And then they can nullify the republican form of government and place the colored race, and labering class of white people, in the same position—only wors—as they were before. And please your honor, Sir, if you cannot grant us a re-election—which we honestly believe that we oght to have—what must we do in such a case? And we can also prove by a colored man, a responsible one—that the Democrat candidate told him that they had beet them. And if the Republicans had had as meny more as they did have, we would have beet them. And as it was, they only beet [by] about thirty. What must we do? Must we put up with sunch [such], when we know there are frode [fraud?]. Know we will die first. Recollect that dividing into townships all of the counties makes a consitable difference—among the colored people—egnorent as they are. And meny and numbers are dissatisfied at the Election except [if] it had bin don fair, and we appeal to our Superior—our Surpream, for refuge. And many others—too tedious to mention, both white and colored. NOTE: For more on violence against freedmen in post Civil War North Carolina, “The Death of a Freedman,” also on Renegade South. Thank you for the post. Cuffee Mayo was one of my paternal great great great grandfathers. P.S. The Boons and Curtises are also ancestors. One of Cuffee’s daughters married a Norwood. The Andersons were closely connected to the Mayo family, e.g., marriage bonds and Cuffee’s estate. Thank you for your comments, Maman Jeanne! I wrote about the interconnected Mayo, Curtis, Chavis, Anderson, Mitchell, and Evans families in my first book, Unruly Women. In court records and on federal censuses they are listed as “free people of color.” At the time, I assumed they were African american, but now believe it likely they were a mixture of Native American, Euro-American, and African American. Can you shed any light on the ethnic background of your ancestors? You are welcome, Ms. Bynum. The Mayo patriarch in Virginia made his mark in Barbados after he left the South of England, finally settling in America. Willliam and Joseph Mayo were wealthy planters. The father was renowned for his surveys of cities like Richmond, VA. In addition to black and white ancestors, I belong to FTDNA, and I encourage more blacks of free and enslaved descent to join the relevant and appropriate yDNA and mtDNA surname groups, unique to this provider to establish (or refute) kinship. I often held the position that we could not have Cherokee ancestry, due to geography and history (Western Carolina before “The Trail of Tears” removal to TX and OK and one of the slave holding “Five Civilized Tribes”). Any Native American ancestry was more likely Tuscarora. The dominant tribe in Central North Carolina was the Tuscarora, who are related to the Pamunkey tribe of Virrginia, also called the Powhatans, like the eponymous chief who was the father of Pocahontas. The settlers finally conquered the tribe through alliances with others that they had subjugated. The Tuscarora were very fierce (like the Zulu). During my original research, organization and finding aid on the papers of a Carolina colony settler, there was a document with a clay seal from their chief permitting the newly arrived Europeans land, regardless of any grant from the British Crown. Recently, my Mayo-Boone cousin, Kellie, connected with a NC-born researcher who established the ethnic connection to this tribe. It is a given that as generations evolve, some features and percentages may not be as dominant in every descendant. My sisters and I all have the same body build, differemt heights and complexions, etc. from the same parents. I am of medium complexion, and one would never guess that Elizabeth Wright or Susan WIlliford were among my antebellum matriarchs. May all mentioned here rest in peace. Susan’s daughter Mary and Elizabeth son’s John married. They were also my great great grandparents, Their son, William (“Willie” Wright, Sr.) married Mary Liza Boon who became parents of my paternal grandmother, Minnie Wright Thomas, who also claimed Native American ancestry. When Mary died, John remarried to Mary Liza’s sister, Susan Boon. “Small world”! Very interesting! the history of various ethnic groups in America is a fascinating one of exploitation, mixture, love and hate, and ultimately some very elaborate kinship networks! Thanks for sharing your ancestry on Renegade South. Thank you for your great comments and questions, Daisydeluna. I always love hearing from the descendants of people I’ve written about, and the Meltons were particularly interesting to me. They–and the families allied with them–certainly had their scrapes with the law and with each other! The nineteenth century slaveholding South was no picnic for poor people of either race, even though they were free. I did not find the particular individuals named by you in my research files, but I did find a good deal of scattered information on people with their surnames. The Valentines, Wilkersons, Murrays, Meltons and Howells turn up occasionally in apprenticeship records, bastardy bonds, and civil/criminal action papers. One Isaac Howell, age 18, black, for example, was apprenticed in 1846 to Lewis P. Allen, white. The crimes committed among these families mostly centered around engaging in public fights or petty theft. I did find a case in 1857 where a Thomas G. Murray was murdered by one David Hays following a corn shucking. Murders were very rare, however; mostly these families seemed to be trying to carve out lives in a society that didn’t provide much opportunity from where they stood–such as the case of Ben, a slave of James Wilkerson, who was charged with “going at large as a free man” during the final two years of the Civil War. My phone cut me off. In the court case people testify that Harris’s father ( who is never named) was of Indian extract, not African. Harris knew his father to be ‘Portugese’. I’ve read of such a claim among stories of Melungeons. the Meltons were not the only Stanly County family of mixed heritage in the decades shortly before and after the civil war. Some individuals even changed races being white in one census and mulatto in another. There were cases in the Murray, Simpson, and Howell, and Kennedy and Solomon families. I know one link starts in 1850 Wolf Pit community in Richmond county, where half the community is noted as Mulatto in the census, but known as ‘Croatan.’ to historians. . .
Decendants of this great great aunt. One has become a very close friend and my favorite cousin. I was wondering if you had came across the 1852 case of NC vs. Harris Melton and Ann Bird or that of Mariah Murray (my gggreat grandmothers sister) who had 7 children during the late 1830’s and 1840’s by Henry Wilkerson, a slave of Jonathan Wilkerson. Or that of a man named John Benjamin Huneycutt, noted in his estate papers as ‘col.’ who had a badtardy bond served against hin by Martha Ann Howell, a white girl whose father, John Travis Howell was killed in the Civil War. The childs name was Sufronia. Silas Curtis and Peter Curtis are my great-uncles. Thank you very much for posting the information. You are most welcome, Eileen. I am pleased whenever a descendant either discovers or is reminded by a Renegade South post of what important roles in history their ancestors played! As always you find fascinating document that testify to the times. Do we know if the Governor took any action? Sam Booth is on the 1870 Census in Dutchville District. If you look a the list of the klans men nearly all are found within a page or so of Sam Booth. Hayward Stem (20), William Boles (34), Henry Harkin (21) were men with no land and very small estates. The Stem, Wheeler and Jones families were intermarried. Many of these men were too young to fight in the Civil War and probably saw very little future and were quick to violence. In the 1870 census none of the three victims could be located and must have been driven out of the county. What do we know of them? Were they successful farmers, is that what made them targets or just bad luck as random victims. These two petitions are truly remarkable and show he courage and determination of the black community to hold their own. Thank you, Daniel, for your good words, and for supplying many additional details regarding the identities of those associated with the Klan. I found no record of Governor William Holden acting on behalf of these particular Granville County petitioners. It’s safe to say his administration was overwhelmed by Klan violence, which was rampant. In 1870, the governor imposed martial law in nearby Alamance and Caswell counties (under the Shofner Law), declaring them in a state of insurrection. Over 100 arrests were made during his war on the Klan. For his efforts, Gov. Holden was impeached by the North Carolina Assembly, thanks to the new Conservative Party that temporarily replaced the pro-Confederate Democratic Party (I detail this in ch. 3 of The Long Shadow of the Civil War). Reconstruction was over; white supremacy soon reigned.